The noteworthy point is that the mechanical inventions were made chiefly by the men engaged in the cotton industry, either as capitalist or dealer or technician. Again the machines were not put into use by majority of entrepreneurs; they clung to the old method of production. But once they knew of the utility of the machines, they adopted them. The need was immediately for a spinning machine. So, experiments and inventions began here. The first machine, called the Spinning Jenny, was invented by James Hargreaves in 1767. It was a small machine containing eleven to twenty spindles only and was run by hand. It could spin cotton yarn fairly strong and durable. No doubt it increased production, and by 1778 there were about, 20,000 jennies in use in England. But being a small machine and hand-operated it could be kept in cottages, and so it did not really mark a change from the domestic system. But we cannot deny that it gave impetus to further technological innovation. So, experiment continued and success came in 1769 when Richard Arkwright, a Blackburn weaver, invented the Spinning Machine. It was a big machine containing many spindles and based on a new principle, the thread being passed between two pairs of rollers, the second pair rotating a little faster than the first one. It could not be worked by hand, and come to be called Water Frame as water-power was applied to run it. It produced yarns stronger and more durable than those made by jenny. Being a big and expensive machine it could not be kept in cottage, and big halls needed to be built up to keep and use them. This motivated the transition to the factory system. The year 1771, was a historic one because Arkwirght, a thorough businessman, set up a factory in partnership with his friend, Jedediah Strutt, at Cromfield, Derbyshire, to produce cotton yarn. It contained several machines, producing huge quantity of yarn. It drew its power from the water of the river Derwent. This was the first cotton mill in history. The venture proved to be such a stunning success that Arkwright set up three more cotton factories at Derbyshire and one at Lancashire. Arkwright became the richest cotton spinner of his day, and the first great modern factory owner, who, as Prof. Hill puts it, was the herald of a new age. Yet experiments for innovating a still faster process continued. Success came in 1776 when Samuel Crompton, a Bolton weaver, invented Spinning Mule, a machine that combined the principles of jenny and the water frame. It produced very strong and fine yarns. It became well-known and purchased by many mill-owners. The high quality yarn it produced enabled the English manufacturers to produce muslins in England, which till then had been imported from India before long mules were constructed that would turn hundreds of spindles. The development was indeed fast and remarkable. The prompt adoption by spinners of the three inventions of Hargreaves, Arkwright and Crompton - made spinning fast and efficient and in consequence, weaving appeared to be slow. The weavers had plenty of yarns to weave and their wage was high. Obviously, the need for machine was felt in this sphere too, more so because weaving had to be done on a mass scale. Of course, a small machine for weaving called Flying Shuttle had been invented as early as 1733 by John Kay but it was not able to meet the latest situation. After much experiment a Power Loom was invented in 1785 by Edmund Cartwright, who was, surprisingly enough, a Professor of English literature at Oxford University. His contact with some Lancashire manufacturers and interest in mechanical work proved to be the motivation behind it but the machine was clumsy and inefficient. Cartwright continued experiment to bring out a better machine for the work of weaving. The result was the coming of the improved Power Loom in 1815. Cartwright incorporated the ideas of John Horrocks, who had invented a metal power loom in 1803. In the 1820s Richard Roberts invented a power that became in course of time the standard power loom. But it must be stated that though the application of power loom speeded up the work of weaving, its adoption was slow. Moreover, its installation was violently opposed by the large community of weavers, who feared loss of their jobs. A factory owned by Cartwright with 400 looms was burnt down in 1792. The general adoption of the power loom, even in cotton industry, came after 1800. After passing through the stages of curding, spinning and weaving, the textile (whether of cotton, wool or linen) was put up for bleaching, drying and printing. The bleaching was done to strengthen the textile. Previously, the raw clothes were bleached by exposure to sun and rain for a few months. Fortunately for the industry, the method of bleaching by chlorine was innovated by a French chemist, Claude Berthollet, in 1785. It became possible thus to bleach cotton cloths in a few days. More durable dyes were also invented during the period and this marked the advent of the chemical industry. The key to the growth of the modern chemical industry was the production of sulphuric acid, a material essential to several processes and particularly important in the manufacture of alkalis and soaps needed for textile. The printing of cotton fabrics was revolutionized by the invention of the Cylindrical Printing in 1783 by Thomas Bell. The design was engraved on the surface of a metal cylinder over which the piece of cloth was run; the rotation continued until the long piece of cloth was entirely covered. The invention of the Steam Engine in 1769 by the incredibly dedicated and selfless scientist, James Watt, was itself a revolution. It gave a great impetus to the Industrial Revolution by providing much-needed energy for propelling the machines. Some historians even hold that the introduction of steam-power was the greatest revolution in economic history since the discovery of agriculture in the prehistoric times. When Mathew Boulton, the great business magnet of the time and business partner of Watt, said, “I sell: here, sir, what all the world desires to have – Power,” he was pointing to the coming of a new age. Indeed steam-power began a series of transformation in industries that would change the face of Europe and later, of the world. The idea of using steam as a source of power was as old as the first century BC when the Egyptian craftman, Hero, wrote about it and his writing was known through the European Renaissance. In the 17th century the French technician, Denis Papin, became the first person to apply steam-power in moving a piston in a cylinder. 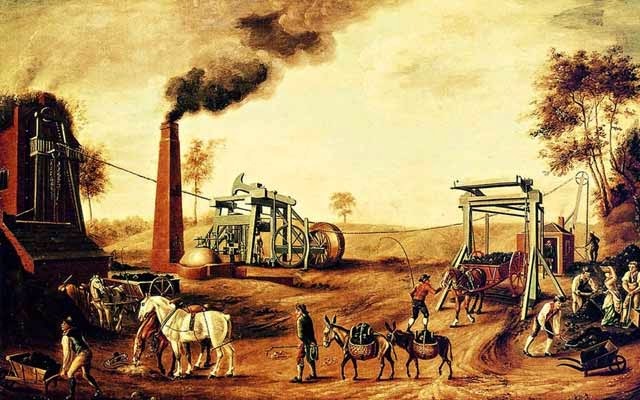 In the early 18th century John Newcomen was the first Englishman to profitably use steam power. He invented an engine based on the principle of creating vaccum in the cylinder into which the piston was forced by the pressure of the outer air. It was, therefore, as much an atmospheric as a steam engine. The vacuum was created by ultimately heating and cooling the cylinder which meant a great waste of fuel. However, the Newcomen engine was used to clear the water that had gathered in the tin and coal mines, to blow blast furnaces and to provide drinking water to towns. But with the widespread use of spinning machines, need was felt for a steam engine that would be economic and efficient in running those machines, so far run by water power. Thus came the invention of Watt. His steam engine not only removed the defects of the Newcomen engine but created something destined to make sensational change in the technology. He first conceived the idea of a separate condenser, a chamber attached to the cylinder into which steam could be admitted and condensed without the necessity of working the cylinder itself. Next he devised a method by which steam, not atmospheric air, could be used to move the piston. Lastly, the most important lf all his inventions, he adapted the piston to rotary motion making it capable of turning a wheel and driving a machinery. Any one of these inventions, done between 1769 and 1790, would have immortalized him; taken together, they made him the central figure in the technological progress of the 18th century. The use of steam engine in driving spinning mules became widespread since 1790. The mechanical inventions continued and next we find the emergence of the machine tool industry. It was involved in the manufacture of accurate machine tools and standardized parts of various machines. The early steam engines were manufactured by the joint efforts of blacksmiths, carpenters and wheelwrights. But there was lack of coordination and the parts built were often faulty. James Watt often complained that his mechanics supplied him with cylinder which were wide at one place and narrow at other. Need was felt for parts with standard specifications. This led to the production of machine tools, devices like the mechanical drill or mechanical cutting machine which would produce parts with minutest precision. Watt along with his friend, Mathew Boulton of Birmingharm, took the lead in this field too. But the real breakthrough came with the outstanding inventions made by Henry Maudslay around 1800. His first invention was a heavy Screw-Cutting Lathe, which produced the first standard screw and the second one was a Slide-Rest for the purpose of metal-cutting tool. Maudslay also raised some serious pupils, like Joseph Whitworth and James Nasmyth, who developed large-scale machine tools production business in Manchester in the early 1830s. They helped to speed up industrial advance in the mid-Victorian period. They built standardized gauges and measuring machines and brought out a series of screws of various measures. Their work drew tremendous attention at the historic Great Exhibition of 1851 in London. Coal and iron are the pillars of modern heavy industry. Interestingly enough, though in use since time immemorial, coal and iron gained the status as prominent Industries with the Industrial Revolution. Let us first talk about coal. In 1700 only two and half million tons of coal was extracted from British pits, and it was used in metal-works, brewery, soap-boilers sugar-refinery, brick-klins, tile-making and for domestic purpose. In 1800 it reached eleven million tons and by 1913 it touched the fantastic figure of 287 million tons. It proves the tremendous importance coal gained during the period of the Industrial Revolution. The demand of coal for use as fuel in other industries, particularly for running the steam engines, was the main reason for its growing value. An extremely remarkable point is that it was the growing use of steam engine that gave a new lease of life to both coal and iron industries. And as more and more iron was in use in various industries, the demand for coal rose with greater momentum. In other words, the rise of coal and iron industries went hand in hand. The emergence of coal as a cheap and abundant fuel makes an interesting story involving a series of mechanical inventions. At first, water was used to run the spinning machine (generally made of wood) and for that reason the cotton mills were set up on the riverside. But the invention of the steam engine created the need to make spinning machines with durable iron rather than wood. This proved to be turning-point for both coal and iron industries. At first, charcoal was used a fuel for iron-smelting. For this reason iron-smelting foundries were located near forests. But the large-scale cutting of trees for producing charcoal created serious problem and the government had to put ban on it. Raw coal could not be good substitute for charcoal because it emitted sulphur that mixed with the molten iron to make poor quality iron. Thanks to the invention of Abraham Darbys (father and son combination) of the method of converting raw coal into coking coal in the 1730s, the entire process of iron-smelting was revolutionized. The method of Darbys of producing coke from raw coal was in wide use for iron-smelting by the mid 18th century. Coke was also used to run the steam engine. Interestingly enough, all the iron works and foundries began to be located near the coal mines, not forests. For this reason coal-mining itself became an important industry. This gave great impetus to the iron industry. Iron masters of eminence appeared on the scene. The most famous of them, John Wilkinson, believed that iron should replace coal and stone in every way. His attachment to iron was legendary, and he owned the biggest iron foundry in England. He built rail roads for mines (1767); the first iron bridge in history over the Savern river (1779); an iron chapel for the Weslyan sect (1787). To honour his love for iron, he was fittingly buried in an iron coffer in 1850. Total output of English pig iron, hardly 20,000 tons in 1720, reached 70,000 in 1788; 125,400 tons in 1796, and 250,000 tons in 1806 which means more than twelve times increase since 1720. Starting innovations and inventions were made in the spheres of transport and communication. They were so highly remarkable as to be called the Transportation Revolution. And they provided further impetus to the Industrial Revolution. We find the process of transformation in both surface and water transport. The noteworthy point is that if the inventions of machines in cotton industry gave mechanical engineering a new status, the changes in transportation similarly brought civil engineering into focus as a serious subjects of study. We find amazing innovative trends in the construction of roads, bridges and docks, canal digging and ship building. In fact, experiments in road construction and canal digging had been undertaken before the Industrial Revolution. The group of road and bridge engineers, the men who would be remembered for all time to come for their constructive genius, included John Smeaton, John Matcalfe, Thomas Telford and John Macadam, all became prominent in the second half of the 18th and early decades of the 19th centuries. They turned road construction into pure science after a lot of research. The age of muddy, narrow and uneven roads was gone-and that of solid, broad and durable ‘Turnpike Roads’ appeared. Now roads began to be constructed with stone chips, heather and bricks to provide a strong foundation, so that they constructed could stand the heavy loads of industrial manufactures. There was proper provision of drainge too and no water-logging was possible. Telford was the greatest of them all and was called Colossus of Roads’ for constructing the longest road, the London-Hloyhead Road. He became the first President of the Institute of Civil Engineers, which marked the advent of a new profession in Britain. Macadam too became famous for building turnpike roads in London and Bristol. The second half of the 18th century has been called the ‘Golden Age of Canals’. The canals, which were dug basically for carrying goods to distant places at very low costs, helped to promote the Industrial Revolution. James Brindly and the Duke of Bridgewater were the most famous names in the domain of canal construction. Lord Bridgewater, who was a wealthy aristocrat with interest in business, owned collieries at Worsley, about 11 kilometres from Manchester. He found that carrying coal from Worsley to Manchester on horseback was so expensive that he could not find customers for his coal, So, with the help of Brindley he dug a canal in 1761 connecting Worsley to Manchester. This was a grand success and the coal carried through the canal became very cheap. This started an era of canal building and by 1830 Britain possessed over 4000 miles of waterways. The famous of the canals were Oxford, Coventry and Caledonia n Canals, all built during the last three decades of the 18th century. Melcalfe, Telford and Macadam also applied their genius in building bridges and docks. Tremendous improvements were made in shipbuilding. Iron came to replace wood in large quantity in the construction of ships, which became stronger and more durable. Some noteworthy steps were taken in the direction of communication. The development of roads meant improvement in postal services. The age of cross-country posts, based on post-boys carrying mails on horseback, was gone. In 1784 John Palmer of Bath got the government of accept the idea of a Mail Coach service protected by armed guards. These fast coaches carried mails between towns till the coming of railways. This made internal communication better.